How do YOU treat pet stains? Remove any excrement and blot the entire wet area immediately and firmly with a clean, white, absorbent towel or cloth. Pour a small amount of liquid detergent onto the cloth or towel and rub stained area with just enough firmness to remove the stain. Mix together 1 quart warm water and 1/2 cup white vinegar. Slowly dribble the mixture onto the stain. Place several clean, dry, white towels over the stained area. Walk over the wet area several times to absorb excess moisture. Place books or other heavy objects over the area. Allow the objects to stand on the area for 4 to 6 hours. Use a soft-bristled hairbrush to raise the nap of the carpet. Then call a PROFESSIONAL CARPET AND UPHOLSTERY TECHNICIAN, annatriumph. Home remedies are for people with low standards and expectations. How many urine stains and odor problems have you been paid to address this year? It's ORY GUN, not OR A GONE. Learn to talk. I like OSR as well. does it work on wool? Are you in a high paying business or are you just a self employed low paid grunt who thinks this business provides dignity? Osr works great for me! I swear by it! Can't go wrong. Times are Changing for the Better! Shaw Floors might just be the company that will bring back the mass flooring installation market to carpets again. Carpeting up until now has not necessarily served the industry and homes very well when it comes to serious spills, stains and odors from pets etc. Shaw has recently invented the new LifeGuard Waterproof Carpet with waterproof backing, keeping spills, soils and odors within the carpet. This new technology prevents these and other contaminants from seeping into the underlying concrete or wood flooring causing cleaning nightmares to both the owner and the cleaner. This is the major reason why the trend has switched from luxury soft surfaces to hard flooring substitutes. Made with R2X stain and soil resistance system - taking the worry out before spills seep in - blotting and extraction becomes easier and more effective. This new technology in carpets will allow the cleaner to offer a truly clean and odor free guaranteed carpet cleaning process. Hats off to SHAW, we as professionals need to support them. Durability and cleanability are important. So are style and design. You shouldn’t have to sacrifice one for the other. 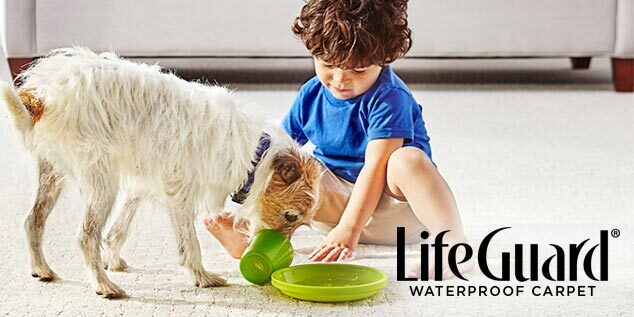 Flooring made with LifeGuard® waterproof backing is engineered for life's little messes, keeping spills, splatters, and accidents contained for complete clean-up protection. I'm positive about the negative...and negative about the positive. 1 Start pouring the vinegar over the stain. 2. Apply the baking soda powder over the affected area. you will hear a crackling sound that means the vinegar starts to react with the baking soda. 3. Keep this solution on the carpet for a few minutes. 4. Once the solution dries up to rub the baking soda and take off into the dustbin. 5. At last, vacuum the carpet properly. If you decide to use vinegar, you can also sprinkle it with baking soda. Wait for a bit and then vacuum it up.